Whether you own a big country home or a small apartment, your living room will most likely include a coffee table. It is usually the center of attraction and the most-used furniture. It comes in different sizes, styles, and finishes and if you want only the perfect ones, then you would also consider the shape, utility, and materials used in construction. Hence, picking the best coffee tables is a critical decision to make. With a lot of choices available today, it is not surprising if you get overwhelmed with all the options that you will have when you start shopping. That is why in this post, we will focus our discussion on the top three coffee tables out on the market today to help you choose the best one for your home. We will cover the features, pros, and cons of these amazing pieces of furniture and make a thorough comparison with another product of the same genre to help you with your decision. Songmics was established in 2012 and is considered one of the largest sellers on Amazon, with millions of shoppers. They offer beautiful, comfortable, durable, and affordable products that provide practical features for home living and advanced designs for space optimization. Their items range from jewelry organization, home furniture, pet supplies, office furniture, and outdoor and sports. It creates an attractive feel and appearance due to its classic style. It is simple to assemble, and it comes with detailed instructions and tools. The dimension is just perfect; not too large or too small. The feet protect feature is adjustable and prevents your floor from being damaged or scratched. The bottom part can serve as a storage shelf and makes a great addition for better organization. Some of the screw holes do not seem accurate and correct. Rustic hardwood and industrial steel are a match made in heaven when combined to make Emerald Home's Chandler coffee table. 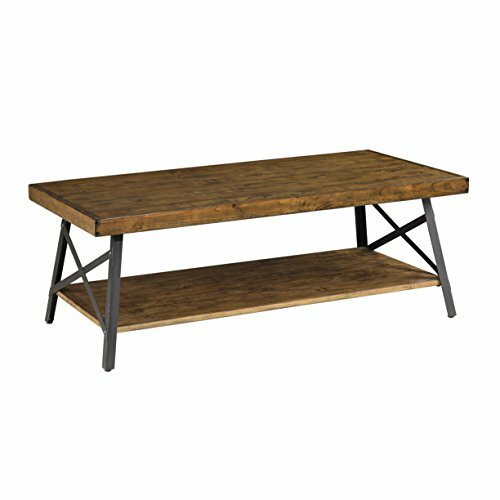 Dimensions: 48" Long, 24" Wide, and 18" High with 10" in between shelves. Emerald Home Furnishings is a supplier to home furniture retailers across the United States and other countries. Their services include motion furniture, leather and fabric upholstery, formal and casual dining room furniture, outdoor dining, bedroom suites, home office, entertainment system, accent chairs, and occasional tables. It has a vintage and classic appearance and feels. It is durable and stable since it is made up of solid wood and steel. The rivets and metal fasteners are exposed to give an architectural look. The bottom part can serve as a storage shelf. The product does not come with instructions on how to set it up. Walker Edison Furniture Company delivers to the District of Columbia and to all 50 states. They install and assemble each product with expertise and offer lease space negotiation assistance, shopping tips, and product consultation. They offer site visits for verification, and they employ experienced and highly-skilled staff who are used to working with unusual space footprints. Its design is versatile enough to fit any theme. It looks elegant and complements any aesthetic. The manufacturer also offers a matching side table. Its size is just about right, and it will not take too much space. The material can be easily scratched. Unlike wood, glass can easily be broken and damaged. 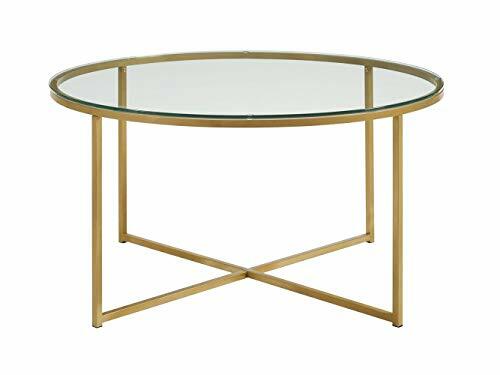 After taking a closer look at the features, pros, and cons of three of the best coffee tables out on the market today, can you now choose which will be an addition to your collection of living room furniture? 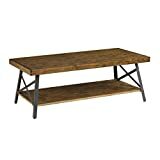 Our top pick is the Emerald Home Coffee Table with Open Shelf which is made up of industrial steel and rustic hardwood. It is durable and stable, and it has a large top space, and the bottom layer can also serve as a storage shelf. They did not miss to add an architectural look and came up with solid steel angled legs with cross-bracing and exposed rivets and metal fasteners. 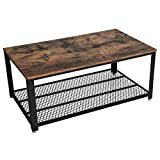 The Songmics Antique Coffee Table, on the other hand, is also made up of wood and steel but is smaller than the Emerald Home Coffee Table, and its details are simpler. This rectangular coffee table has an antique or classic feel and look. The WE Furniture Coffee Table, however, is the smallest and though also made up of steel, it is complemented with a durable glass top. It also has a matching side table. We can say that they all have their advantages and disadvantages. Their differences in style, size, shape, cost, and materials used make them unique in a way. However, before you make your decision, you have to consider a couple of other factors such as your budget, what your space can accommodate, what design will fit your current theme, the durability of the materials used, and how tedious will it get when it comes to clean up. A coffee table may be a small furniture, but it can make a big difference and give accent to your home. The best course of action now is to take your time and consider the mentioned factors so you can end up choosing the perfect table that will not just fit the space you allotted for it but give you great aesthetic pleasure as well.